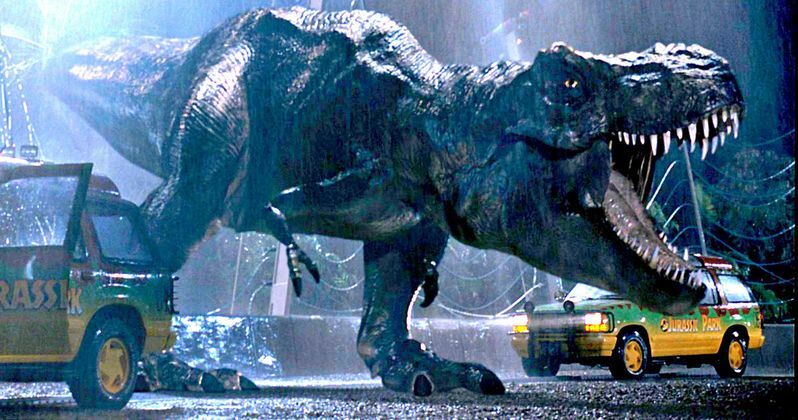 There are a lot of iconic things about the Jurassic Park franchise, but there is arguably no more iconic thing than the T-rex, which fans have taken to calling "Rexy." The original T-Rex from Jurassic Park made her triumphant return in Jurassic World, via her battle with the Indominus Rex at the end of the movie. It was unclear if she would be returning in Jurassic World 2, which is currently filming and is set to be released next year, but we now have confirmation that the classic T-Rex is coming back this time around. Jurassic World director Colin Trevorrow, who is co-writing and producing Jurassic World 2, recently took to Twitter to confirm that the classic T-Rex is going to be one of the featured dinosaurs in the upcoming sequel. He was responding to a fan who posted a photo of his daughter with a Rexy toy and asked if he could confirm whether or not the dinosaur would be showing up in Jurassic World 2. Colin Trevorrow didn't disappoint. Here is what he had to say. "Confirmed. Tell her when she wakes up." So that guy's daughter, and presumably most Jurassic Park fans will be happy to know that the T-Rex is going to be back on the big screen next year. As for how much screen time the T-Rex will have and how she will factor in? That is up in the air, but she will be in Jurassic World 2, that much is certain. It is possible that she won't be in it that much, since it has been said that the sequel won't just be dinosaurs chasing humans around on an island. Since the T-Rex is still hanging out on Isla Nublar, it might be hard to include her elsewhere in the movie. But since Universal hasn't yet released any official plot details for Jurassic World 2, it will be hard to know really what dinos will be in the movie and how much they will be in it. We do know that Jurassic World 2 is going to be dealing with the issue of dinosaur rights and what to do with these creatures now that the park is closed down. There are rumors that suggest some sort of event will force a rescue mission of some kind. It is suggested that everything from the government bombing the island to a volcanic eruption could force this rescue mission. It is also rumored that Jurassic World 2 will further the idea of militarized dinosaurs, which is something that really got going in the many years of development that lead to Jurassic World. There is plenty of concept art online of dinosaurs sporting weapons. So maybe we'll see a weaponized T-Rex in Jurassic World 2? The Jurassic World 2 cast includes Chris Pratt, Bryce Dallas Howard, B.D. Wong, Toby Jones, Rafe Spall, Daniella Pineda, James Cromwell, Geraldine Chaplin and Ted Levine. Jurassic World 2 is written by Jurassic World director Colin Trevorrow and Derek Connolly. The movie is being directed by J.A. Bayona and is set for release on June 22, 2018. You can check out the Twitter exchange for yourself below.